I think my zone is 5-7 but each site seems to give different zones. 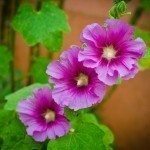 I am confused about all the different answers concerning the planting of Hollyhocks. I live in the high desert of NM, and the ground is mainly "sandy dirt." Hollyhocks grow very well around here, compared to most other plants. My question: I have recently planted many Hollyhocks even though one site said you could plant in the fall, other sites state only in the spring. My seeds came from a neighbor's plant. Why is the favored time in the spring? My neighbor did not even plant Hollyhocks, as they evidently came from other plants in the area and his yard is full of them. If you should only plant in the spring, just how do the plants re-populate as the seeds drop in the fall? Most of my yard is sun, as is all the neighbors. I've planted Hollyhocks along the fences, sheds, and individual small sites. I water them every day, and have my fingers crossed. One more question, again various answers. Some say to use wood stove ashes, some say compost, wood shavings, on and on, are they all ok? So, what is your opinion? You say spring, good irrigated dirt, not close together (I just sowed them in the dirt I loosened with a hoe. I'm sorry this is so long but it is really aggravating to read such opposite opinions. Thank you for your time in reading this. You can scatter the seeds in the fall and direct sow. Here are some articles about composting wood ash.